While not the most well-known or popular means of fishing, sitting on the best float tube lets you spend time in the water on a “floating lounge chair”. These devices let you relax and be in your element where you can get away from everything else and enjoy what you love to do. One the biggest advantages of this type of watercraft is that it is very small in size, easy to set up and deflate and very convenient to navigate. Plus you are your own boss in the water. Here’s a quick overview of our top selections. We’ve also included reviews underneath so you can compared their different features. Here’s a link to Amazon.com’s top rated float tubes. Best Float Tube for the Money: For any fisherman who wants a relaxing and fun way to fish without having to get into a larger craft this float tube is a great way to go. This comes with a compact design that lets you bring it in the trunk of your car or carry via backpack. The camo design makes it suitable for hunting and fishing as well as it helps you blend into the environment. This tube comes with a 250 lb. weight capacity which fits a big individual. It lets tall individuals enjoy time in the water without having to use a canoe, kayak or pontoon. We like that it offers a good amount of room and provides excellent buoyancy. This lets you float well and focus on fishing. The backrest also provides comfortable seating while a number of D-rings and pockets let you store and clip fins and other gear. The unit once fully inflated measures 42” long by 41” wide. It stands 23” high. It comes with a fish ruler as well as stripping apron and fishing rod holder. As far as storage goes, you get 2 zippered pouches and 4 mesh pockets. Affordable Float Tube: Those looking for a budget model can go with the Teton Float tube. This tube comes with a slightly more compact size and a much lower cost. It measures 42.5” long by 40” wide and is 18.5” high. While there’s little difference in the footprint, the lower height also puts you lower to the water, and a bit less buoyancy compared the one above. It does however offer very similar features including a quick release striping apron which has a fish ruler, and the same 250 lb. user weight capacity. The sitting area isn’t as large as that of the Camo Gunnison but you get the backrest, a good number of pockets as well as good tracking and steering. Note that like the Camo version above, this doesn’t come with backpack straps so if you want to be able to carry it around on your back, you’ll need to get a backpack for it. It weighs around 16 lbs. which makes it okay to carry. Not the lightest of float tubes but still not difficult to carry on your back. Should you prefer one that comes with a backpack straps try the Cumberland at the bottom of the reviews, which allows you to easily strap the entire inflated float tube on your back and walk with it. Overall this is a solid option for anyone who likes to spend a relaxing time fishing. If you like sitting higher out of the water the Camo Gunnison above would be a better option. But if that isn’t much of an issue and price is more of a concern, then this will be a better option to go for. It’s compact, and inexpensive. You can spend the afternoon floating on the lake or river. Built in the U shaped design, this is a lightweight, quality watercraft that allows you to steer and control while fishing at the same time. It weighs just over 9 lbs. making it easy to transport. It also has a good 225 lb. maximum weight capacity. The unit is designed to be durable, using heavy duty rip stop nylon material and double stitching on the critical seams so they don’t tear open. The device comes with multiple D-rings for you to clip gear on, as well as a front rod holder on the right side. There are also 2 main pockets for equipment and fishing gear as well as a number of smaller pockets littered around the unit. The device is easy to inflate and comes with a backrest bladder as well as a main bladder in the shape of a U. A large oversized seat lets you sit in the middle of this U-shaped float tube letting you control both steering as well as being able to reach all the things you need to fish. Best Float Tube: If comfort and features are what you’re after, then this is a higher end model to consider. It costs just a little bit more and is also larger but you get a lot more extras. A larger craft: at 56” long by 44” wide and 19” high. It also has a much higher capacity at 350 lbs. This tube lets you sit higher out of the water so you stay drier. It’s large seat is thickly padded and has an high, adjustable backrest. Together these features give you more room to be more comfortable. Keep you higher over the water and provide you with better seating and back support so you can spend longer fishing without any discomfort. Very rugged, this it built solid plus comes with very practical straps that let you carry the entire device on your back like a backpack. This allows you to walk to your fishing spot and save yourself from using the car. The 2 rod holders also let you put more bait in the water compared to most which only offer 1 rod holder. Overall, as far as comfort and features go, this is the top option to get. 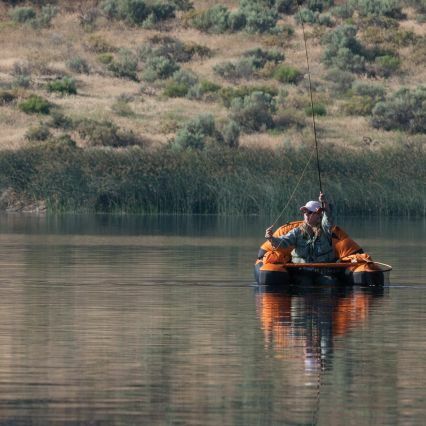 The compact size and convenience of the best float tube lets you enjoy fishing whenever you want to. It lets you get to the closest creek, river or lake to fish without having to pull out a larger watercraft. This lets you go catch fish anytime you want without having to travel too far away from home.